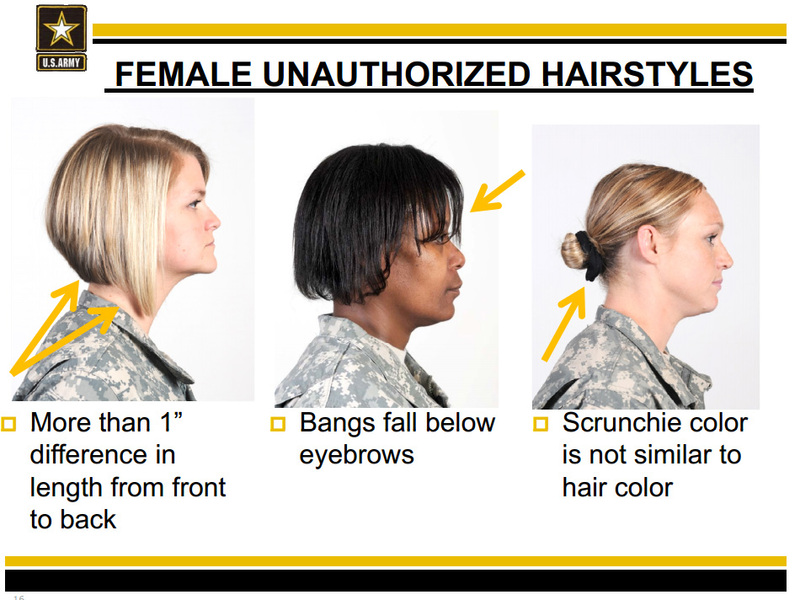 The U.S. Army this week issued new orders — 69 pages of them — that dictate the personal appearance of people in uniform. But it’s the section on hair, particularly those for women, that is causing a bit of a backlash among some troops. Some braids are allowed. But no twists. Cornrows are allowed, according to the Army, but no scalp can show between cornrows and it can’t be more than 1/4 inch thick. Is that a racist — or at least a culturally insensitive — policy? “I’ve been in the military six years, I’ve had my hair natural four years, and it’s never been out of regulation. It’s never interfered with my head gear,” Sgt. Jasmine Jacobs, of the Georgia National Guard, tells USA Today. She wears two twists, so she started a White House petition drive to get the regulations relaxed a bit. My wife still complains about the disaster of a hat she had to wear with her Class A uniform. Also that awful lime-green dress. Problem takes care of itself if we work on needing fewer soldiers. This just adds to the perversely arbitrary US military traditions enshrined by tropical whites, use of black umbrellas, and maternity battle dress uniforms. “Scrunchie is not similar to hair color”? Seriously, where can you get blond hair ties? There’s something for people of every color not to like here.